7 The only one not to appear in the anime? 10 Absence in other canons? 11 Can I add this? 19 Is this looking too much into it? 20 Why Leaf and not Green? 23 Leaf is her most common name? 28 Leaf now called Green in Pokémon Let's Go? 29 Is LGPE Green the same person as Leaf? 31 The "Green/Leaf" title is REALLY necessary? Er, no. When it comes to the games' canon, internal game data > manga name. Otherwise we should be calling Brendan "Ruby" and May "Sapphire". Leaf was supposed to be in the original Red and Green versions, due to the fact that on Nintendo's Official guidebook, it depicted a female trainer with long brown hair, a black dress, white gloves and short black boots, alongside the male protagonist and the rival. It is believed she was supposed to be in the game, but was left out for some reason. The only one not to appear in the anime? Is this looking too much into it? Why Leaf and not Green? Since it wouldn't let me post for some reason earlier today, I didn't get to post my reply to Purimpopoie. I'll go ahead and post what I tried to post earlier today but couldn't. Kay, so some kind anons on 2ch were able to clear up for me the true origins behind the name "Fuguri." Here's the answer that I ultimately received. The very first FireRed/LeafGreen thread was titled "FireRed LeafGreen" (ファイアレッドリーフグリーン) without the &. Because of that, people responded with, "FireRedLee & Fugurin (ファイアレッドリー＆フグリーン)? What an obscene title!" I have a feeling that's how the "Fuguri" thing started. Incidentally, the male protagonist was also called "Red Lee." Though now the names "Remake Red" and "Leaf" have permeated [the fandom]. Leaf is her most common name? Leaf now called Green in Pokémon Let's Go? So far the only official news release by Pokemon.com and their social media sites make no verbal mention of Red, Blue, and Leaf/Green. They don't even provide official clean renders of the artwork of the later four Gym Leaders, which the English trailer showed. Until we get clarification from Pokémon itself, or the game releases, we can only consider this idle speculation by Polygon. Whatever she will be called (probably Leaf) we should consider that the Let's Go games might take place in their own separate canon from the other core games (I don't deny they're main series, I question if they're a separate branch in the main series) since the new protagonists seem to replace the classic ones in Pallet Town while the classic ones are still existing and out and about. So perhaps in that case a separate page, for example Red(Let's Go) and the Red(game) page we have, coexisting as counterparts would be in place. Is LGPE Green the same person as Leaf? Starting a new section because the last one got a bit out of hand. My argument is as follows: Green shares more visual similarities with her Gen 1 design than she does with Leaf, and shares her Japanese name with her Gen 1 design but not with Leaf. 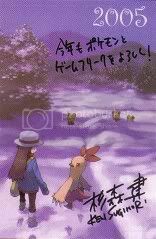 Because Leaf's Japanese name was given to her during the development of LGPE, she would have been named as "Blue" (ENG Green) on that figure if she were the same character as Green. Also, there are no official sources that state that Leaf is the same character as either version of Green. This means that the following course of events is very possible: Nintendo/Game Freak decided to put Red/Blue/Green in LGPE. Because Red and Blue are based on their Gen 1 designs, they chose to use Green from Gen 1 instead of Leaf from Gen 3, despite the fact Green didn't make it into the finished version of Gen 1. Green did take some traits from Leaf, but is still a distinct character of her own. My argument is that the Green we see in LGPE shares all physical features with Leaf and wears a hybrid outfit of hers and Leaf(these similarities were not the case with Kris and Lyra) and are both associated as part of the Kanto trio. Back when FRLG came out they updated the original trio, Red got a new outfit, Blue got a new outfit and unused gen 1 girl got a new outfit, she so happened to be named Leaf in the data so that is the name she got stuck with on here, but that holds no merit, Blue was named Terry in the data, so should there be a Terry(game) page? No, of course not. Had she be named Green back then, I'd highly doubt we would be having this discussion and everyone would easily accept that it is the same character just like everyone accepts that fact for Red and Blue. Just to contest a common point being brought up here: Kotobukiya is not a "Game Freak" source, but this does not make it unofficial. Someone at The Pokemon Company obviously had to take a look at the product before deciding that it was an accurate representation of the franchise and gave it the official seal of approval. TPC has a storied history of strictness and standards in interacting with these affiliates. Despite Let's Go already being in development at the time of the figure's conception, they clearly had no issue with Leaf as the character's name. Unless the staff is interested in introducing a magical "degrees of canonicity" system, I don't see why it should be discredited. There are a wellspring of things on the wiki considered canonical by current standards that haven't been directly echoed by Game Freak gospel, but have been run by TPC/TPCI and are considered fine--ThePacisBack (talk) 10:36, 18 November 2018 (UTC). The "Green/Leaf" title is REALLY necessary? I don't understand why there's a whole bureaucracy with her name compared to all the other characters. Honestly... she was NEVER called "Leaf" in any official media. This name was taken from the internal files of the games, which is understandable to use this name until the present time, because it was the closest of a name that we had for her. But it was never completely introduced into the canon of story, it was always a conjecture that the fandom settled over time. But now that she's finally got her name formally introduced as "Green/Blue" in the games, it seems that this commodity is hindering leaving the name "Leaf" aside. The same applies to the character "Silver" as we believe it to be his name on bases that are just conjecture. If he has an official name one day, chances are it will be something different. Will we simply put on his page: "Canon name/Silver"? Doesn't sound professional to me. Personally, I'm opposed to this whole "Green/Leaf" and "Brendan/Landon" thing. IMO, Green should be her main designation for most uses to avoid unneeded convolution. While figures ARE official and directly based on the games, they're just interpretations, supplementary (and not integral) in nature. Yagamitaichi, I like your solution: refer to her as Green within contexts of LGPE and FRLG, and as Leaf for the figure for now. FWIW I think people should get to share their own opinions about the matter. If their opinions are, like mine, that we should be using one name for the two iterations of this character, then so be it. I do remember that the unused character's information was, prior to this whole debate, on this page, and I believe that it still should be, as it is a clear predecessor Green, but I don't understand how that changes anything about Green or "Leaf". If anything, IMO, it only serves to cement that Green from LGPE and Green from FRLG are one and the same. I think I understand your position a little bit more. However, up until November 16 of this year, information on the unused female protagonist was on this page-- we had been treating them as the same up until then, as I also believe we should continue to in the future. Additionally, I think that "Gold" from GSC was just as much of an established character as "Leaf" from FRLG. I don't really think that LGPE Green was given the name "Green" to canonize the unused character and to reference Pokémon Adventures, as she didn't really have a canon name prior to LGPE, just a placeholder name that was widely adopted by the community. (resetting indent)So the way the article is currently written, it seems to be treating Green’s iterations from FRLG and LGPE as the same character. Putting my personal opinions on whether they’re the same character or not aside, this still to me seems super confusing. I know I’m beating a dead horse but honestly it’s ridiculous to have two names for (what we are treating as) one character. Assuming that they’re the same character, why does her being explicitly given a name in LGPE not override whatever Kotobukiya decides to name their figure, especially before it’s even officially released? Using two names for one character is honestly just confusing as hell to read, and the fact that one is from the games explicitly and the other is not just adds to that. So, let's have one final discussion regarding any controversies on "Leaf" and "Green" being the same person or not (let's not confuse with this with the Green/Leaf naming controversy, which is a different, albeit closely related issue). The older ones seems to have become overlong and riddled with personal opinions without much regard to actual evidence on both sides. Things just got harder and harder to follow as time went on. Same hairstyle as seen on FRLG and Gen I artwork. 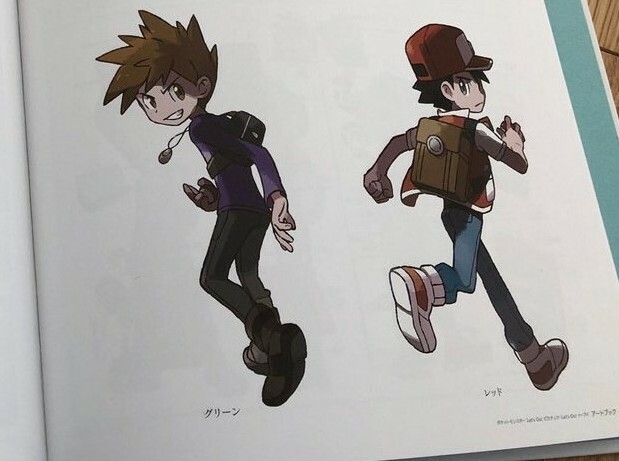 Red and Blue are 'slightly updated' Gen I-like designs, so Green was changed accordingly to fit the theme (Remember Sugimori said he just updated the Gen I girl for the female FRLG protagonist, rather than creating a new character from scratch). "Leaf" trademark pose from the FRLG Trainer Card is the same as Green's challenging pose from LGPE, hair flip and all. Someone asked Ken Sugimori on Twitter about her default FRLG name, and he responded "Leaf... Maybe?" However, 'default name' in a broader sense, 'may' not necessarily mean the same thing as the "canon name" to be used throughout the game series. The Generation I Rival's canon name is "Blue" for example, despite that not being a default name for him in Pokémon Blue or the remakes. I think this is not difficult to understand XD. In remake line, she was named Leaf (Gen 2 girl named Lyra in this line), and in original line, she was named Blue/Green (Gen 2 girl named Crys in this line). She can be the same character or a different character. In some respects, the judgment of Pokemon Adventures manga is justified. Although I know that some people don’t think so. This page does not need to be split in my opinion. Crys/Lyra, Gold/Ethan, Elio, and Selene things already confused enough. 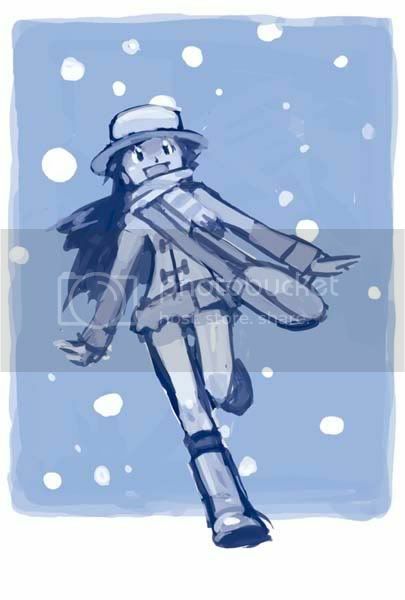 I only want to change infobox picture to LGPE instead of continuing to use Leaf's picture. Kris and Lyra have been confirmed to be separate characters, unlike Ethan, Elio, and Selene. Also except for the figurine, Leaf was never officially used as a name for the character. In addition, as far as I'm aware and can find, the figurine was announced as Leaf, and has yet to actually be released. 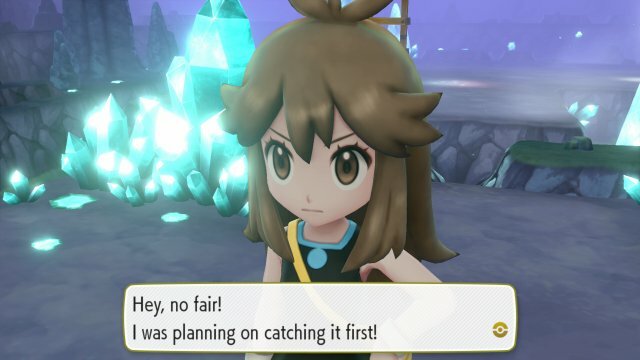 Something that is announced can easily change once it's released, and also, let's not forget that the announcement came out shortly before Pikachu & Eevee, and at that point we had no confirmation that even Red or Blue were going to appear. She may've initially intended to be named "Leaf" in Pikachu & Eevee, but changed late in development, or the artist who designed the artwork for the figurine, Hitoshi Ariga, was unaware that she was going to be called Green in Pikachu & Eevee (he didn't work on Pikachu & Eevee, so this is possible), calling her Leaf, since that was the fan consensus name for her at that point. Fact of the matter, we don't know who exactly coined her Leaf, whether it was someone at Game Freak or Kotobukiya.